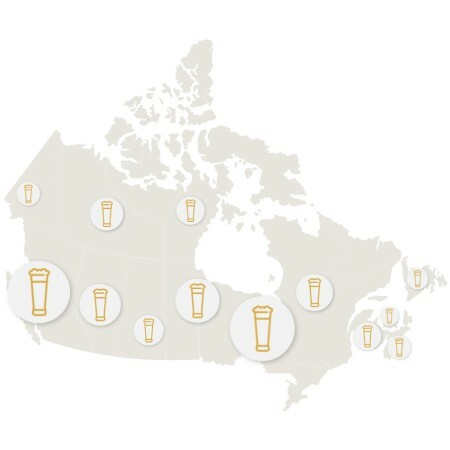 There were 817 licensed breweries operating in Canada at the end of 2017, an increase of 17.6% over 2016, with more than half of them located in Ontario and Quebec. There are 2.8 breweries per every 100,000 legal drinking age adults in the country, an increase from 2.4 per 100,000 in 2016. While Canadian beer production increased slightly in 2017 — up 0.3% compared to 2016 — sales of domestic products dropped from 85% of beer market share in 2016 to 84% in 2017, and total beer sales were down 1.1% versus the previous year. Cans continue to increase in popularity as a packaging format, now holding a 60% share of the market, an increase from 56% in 2016. Bottle sales dropped from 34% to 30%, while draught remained essentially unchanged at 10%. For more details, including provincial and territorial breakdowns of the statistics, see the full report on the Beer Canada website.